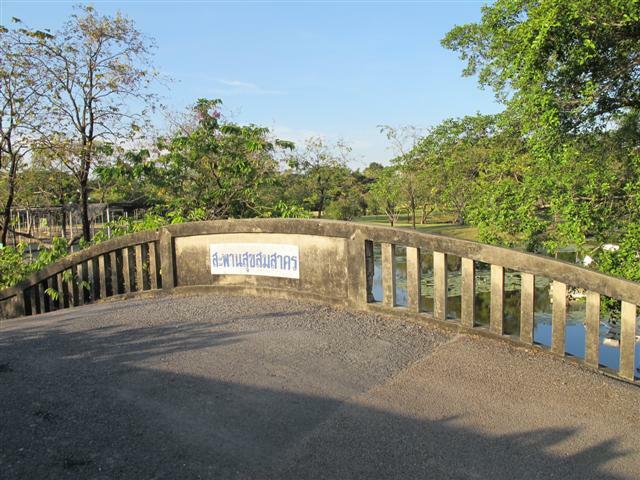 …at Rama IX Park, the many small waterways that run through the park are crossed by numerous small footbridges, each of which bears a sign with its name in Thai. At Rama IX Park as I wandered around this morning I had an impromptu reading lesson, trying to sound out the name of each bridge we came to and then getting the corrected version (plus tips on reading Thai) from my friend, who would also explain the bridge’s name to me using Thai I could understand. All the bridge names had to do with water, and most of them also had to do with happiness (or some variation thereof); but the interesting thing was that none of them used the basic words for water (น้ำ) or happiness (ความสุข). None of them were words I could recall having heard previously — well, not that that really means anything — but I had the feeling that they were maybe not-so-common words. There wasn’t much explanation for the water words in terms of distinctions between them — apparently water is water is water? — but the happiness words all seemed to point to different types of happiness-experiences. As my friend observed, Thai has a lot of words for water, and a lot of words for happiness! I forgot to take my camera, and I didn’t even have a pen and paper on me, so my new discoveries went unrecorded. But if you’re in Bangkok, I would advise you to go to Rama IX Park and discover water and happiness for yourself! This entry was posted in Bangkok, language learning, reading Thai, Thai language, words, written Thai and tagged Rama IX Park, second language acquisition, signs on 17 July 2015 by adamf2011.